An environment interacting with portions of a system leads to multiexponential interaction rates. Within the Keldysh formalism, we fictitiously homogenize the system-environment interaction yielding a uniform decay rate facilitating the evaluation of the propagators. Through an injection procedure we neutralize the fictitious interactions. This technique justifies a stroboscopic representation of the system-environment interaction which is useful for numerical implementation and converges to the natural continuous process. We apply this procedure to a fermionic two-level system and use the Jordan-Wigner transformation to solve a two-spin swapping gate in the presence of a spin environment. via Phys. Rev. 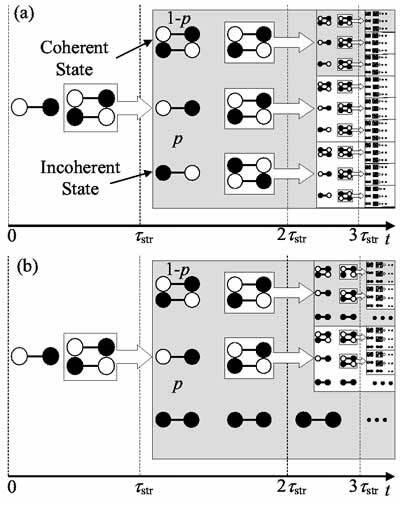 A 75, 062116 (2007): Decoherence under many-body system-environment interactions: A stroboscopic representation based on a fictitiously homogenized interaction rate. Quantum branching sequence for the swapping dynamics. Panel a) stands for a Coulomb system-environment interaction and b) a pure hopping one. Single states represent states with interrupted evolution (incoherent) while pairs of states are coherent superpositions. Notice the self-similar structure.